The somewhat late arrival of sedge wrens this year at Goose Pond Sanctuary has not affected the overall numbers of this small bird. At Goose Pond, we expect sedge wrens to return around the 4th of July. We anticipated their return this year so we could confirm nesting for them in our Breeding Bird Atlas blocks. However, while on a frog count at Goose Pond on July 14 at 10:30 p.m. we were listening to the calls of two Virginia rails when we heard our first harsh introductory notes followed by a slow buzzy trill of a sedge wren. Sedge wrens can call throughout the day and night. Goose Pond staffers Tony Abate and Maddie Van Cleve found four sedge wrens west of the pond the next morning. Two days later while working with interns in the Wood Family Prairie, nine male sedge wrens were counted and Tony spotted a bird carrying nesting material in its feet, a confirmation for the Arlington priority atlas block. Over the next few days we found sedge wrens present at many of our prairies including the Browne and Sue Ames Prairies. In the first Atlas project, sedge wrens were found primarily in sedge meadows and in native and restored prairies that provide tall, dense habitat. Their close cousin the marsh wren is primarily found in cattail marshes. In 1991, Sam Robbins listed the sedge wren as a common summer resident. He went on to mention that in 1911, Columbus area farmers reported that they saw “hundreds” of eggs” destroyed by machinery when cutting hay, most of which were likely to be the eggs of sedge wrens. Sedge wrens were probably “abundant” at the turn of the century. 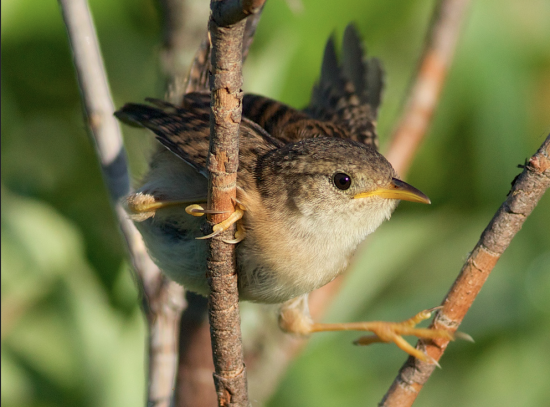 In 1999, the Fish and Wildlife Service “identified the sedge wren as a conservation priority in the Midwest due to its rarity and declining population.” Researchers believe that Wisconsin is in the center of the sedge wrens breeding range. There have been relatively few field studies of this species, and thus many aspects of its natural history remain poorly understood. It would be nice to learn why sedge wrens return in July to Goose Pond when they are reported to nest in Wisconsin in late May and June. We invite you to visit Goose Pond in August to view your beautiful prairies and to search for the nomadic sedge wren.